So the interview thing with Ryan did not pan out yesterday – he wound up getting tickets to yesterday’s game, and I can’t blame a guy for wanting to see free baseball, not on a day like yesterday. 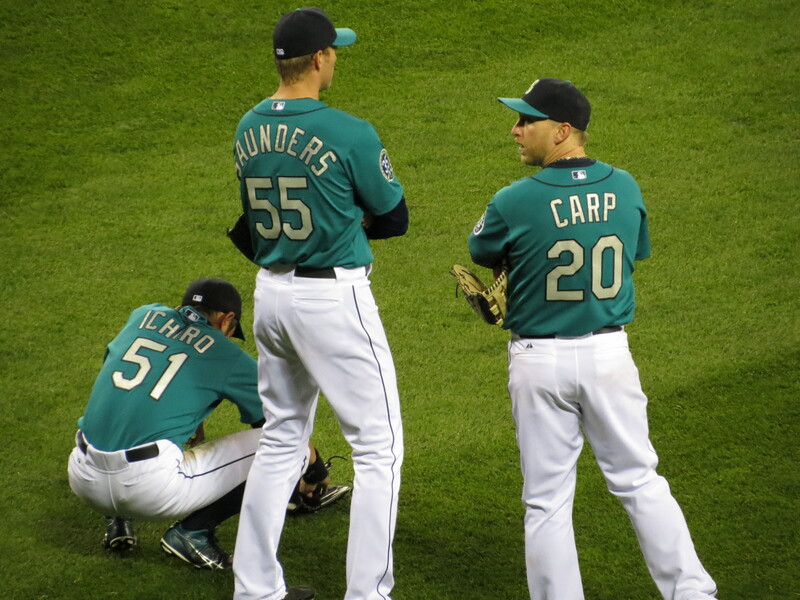 I listened to the game on the radio while running errands around town, and am glad to see the Mariners headed back towards .500, and still above the Angels, even if only by half a game. I’ll take it. I will also take the Baltimore Orioles having the best record in baseball right now because this would be the first time in my baseball fandom that some time elapsed in the season and a team I really liked had a record like that. Not too shabby, Birds. Keep it up! 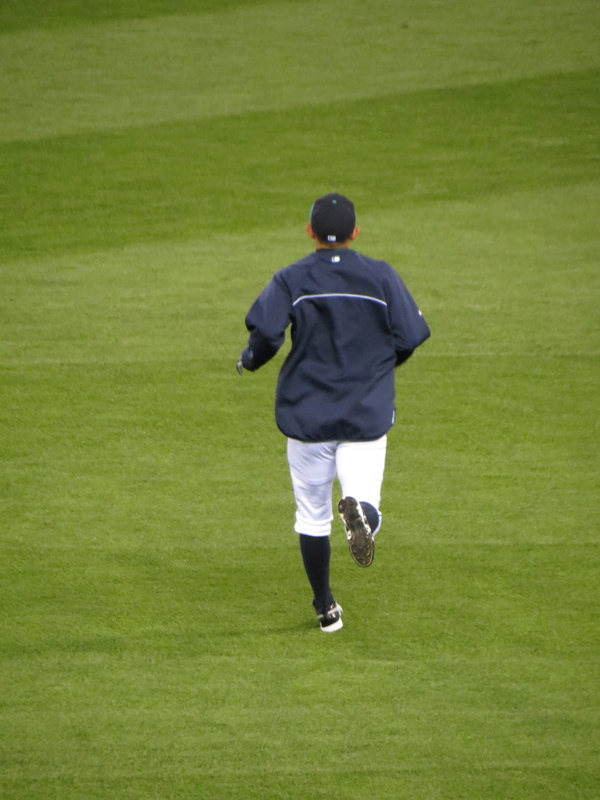 Munenori Kawasaki taking some warmup before the game. 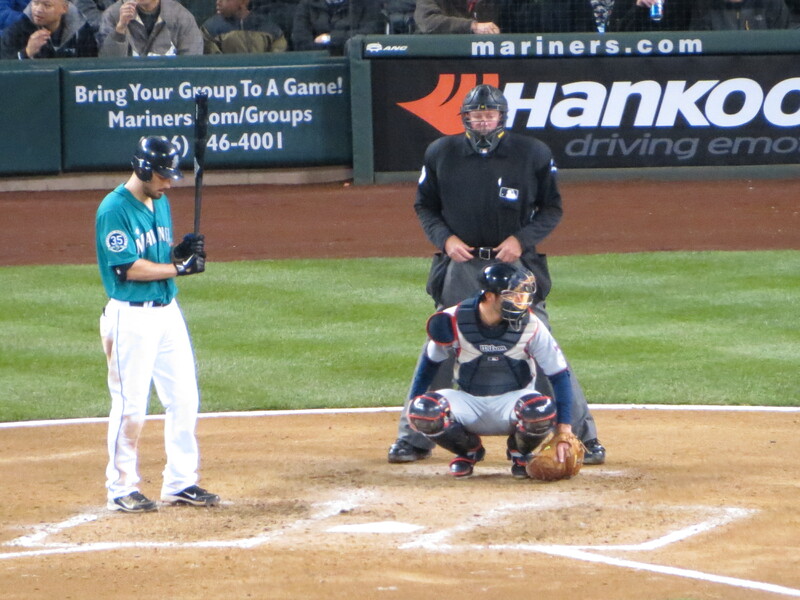 You can always tell Kawasaki from a distance because he wiggles his hands a lot to loosen up his wrists. If the high socks don’t give it away, the hand-flinging will. 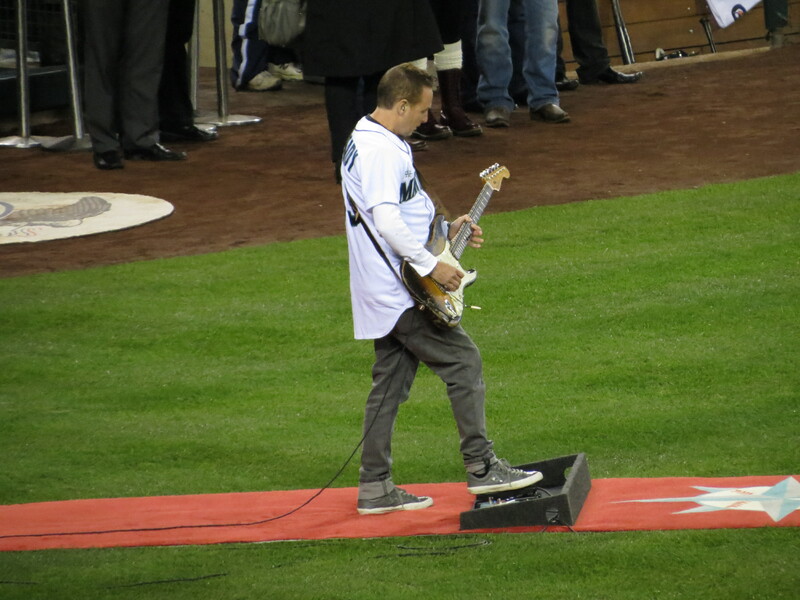 Mike McCready of Pearl Jam rocking out the National Anthem. It wasn’t anything fancy, but it was very solid and the crowd loved it. It was cool to hear. Jason Vargas, prior to first pitch. 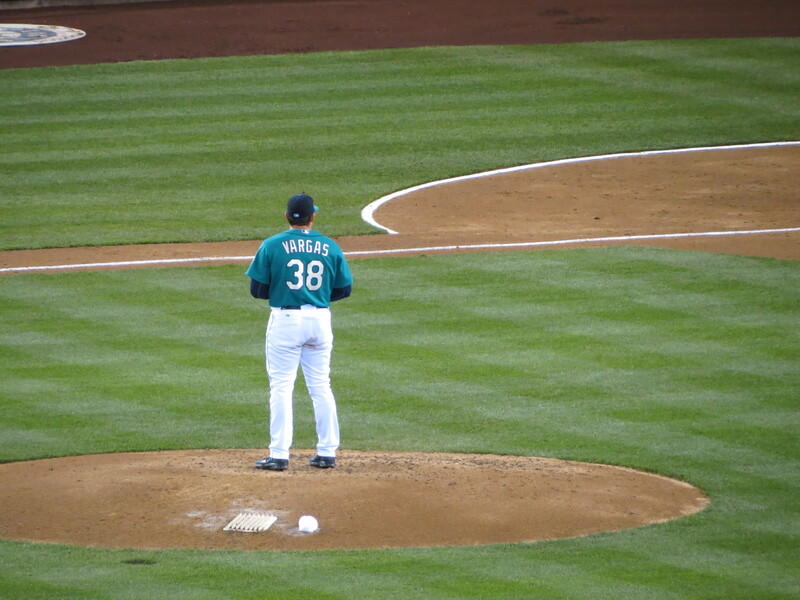 Friday was not the most stellar performance from Vargas, but everyone has their bad days. Over 6.1 innings he threw 103 (!!!) pitches and gave up four hits, two walks, and a run. Wait, I guess that’s not so awful. 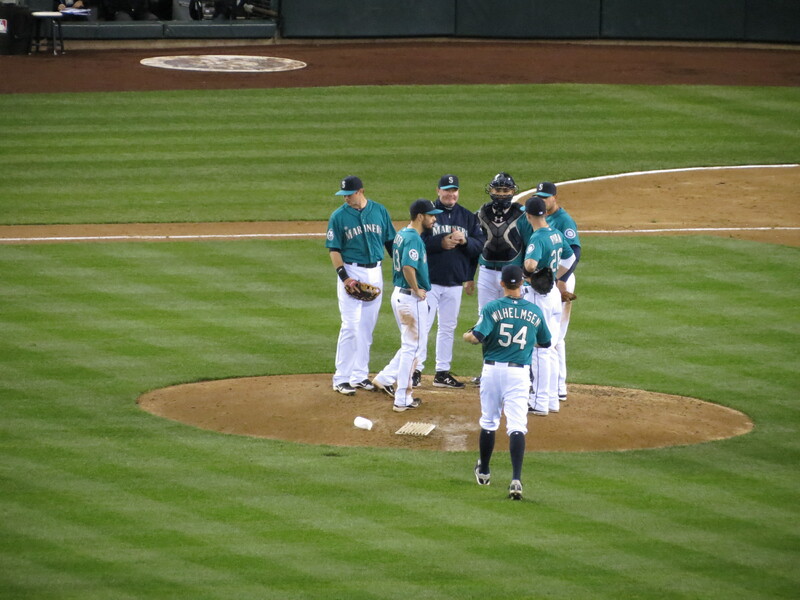 This really was Wilhelmsen’s fault. Yikes! 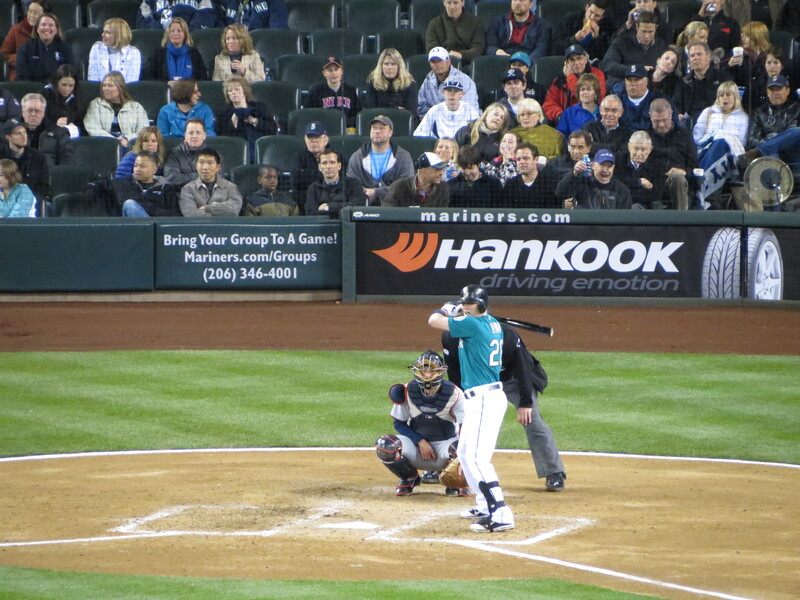 Dustin Ackley steps up to the plate. 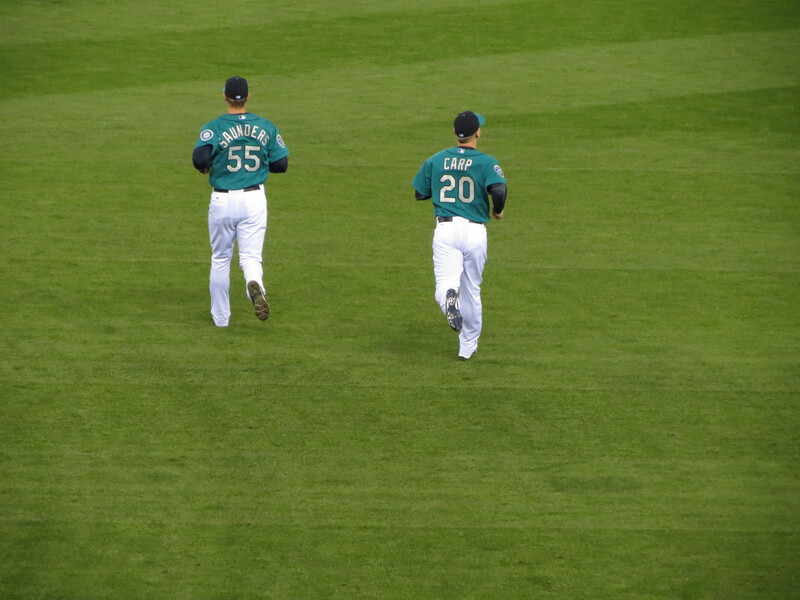 The outfield waits for Wilhelmsen to warm up. 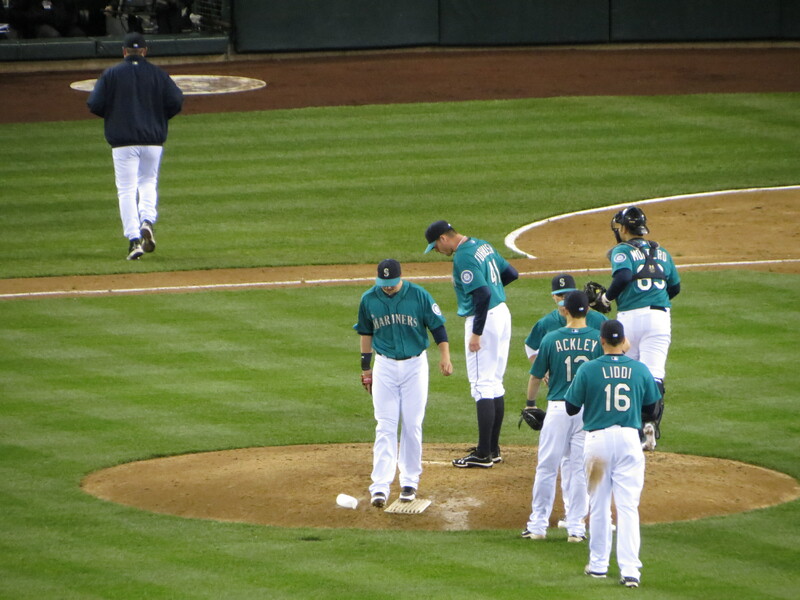 Having replaced Wilhelmsen with Charlie Furbush, Eric Wedge makes his way back to the dugout while the infield mills around. 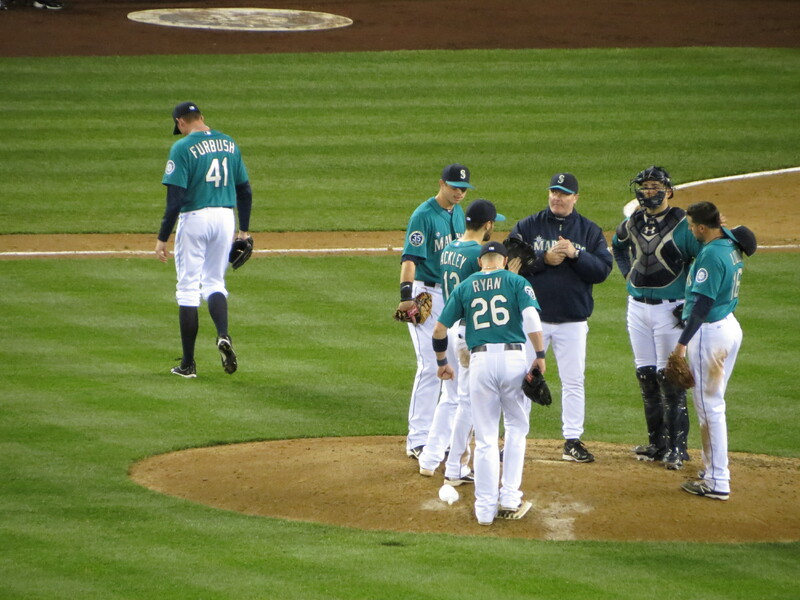 Jesus Montero helps Furbush get warmed up. Furbush leaves the hill after pitching to one batter, Joe Mauer. Mauer’s single allowed Trevor Plouffe to score, and advanced Jamey Carroll to second. Jamey Carroll’s Game Day photo is terrifying. And that was pretty much it. Steve Delabar replaced Furbush, and managed to keep any more runs from coming in, but the Twins had already knocked us around, and that was pretty much it, the game was over in the 7th. Brandon League was brought in, stadium lights and awful math-metal song and all, but the game was gone. I didn’t understand the use of League other than to get him throwing some- and maybe that was all it was. The song and lights and all didn’t make much sense; why the hype for a non-save situation? Also, I don’t mean to spend the last bit of this post complaining, but League’s song is not something that gets the crowd riled. It’s just not. David Aardsma’s song was something I could deal with and eventually came to love, but with closer songs, it just has to be something that is easy for people to clap with or rock out to, and whatever League is using is neither of those things (my knowledge of the nu-metal genre is limited on purpose). 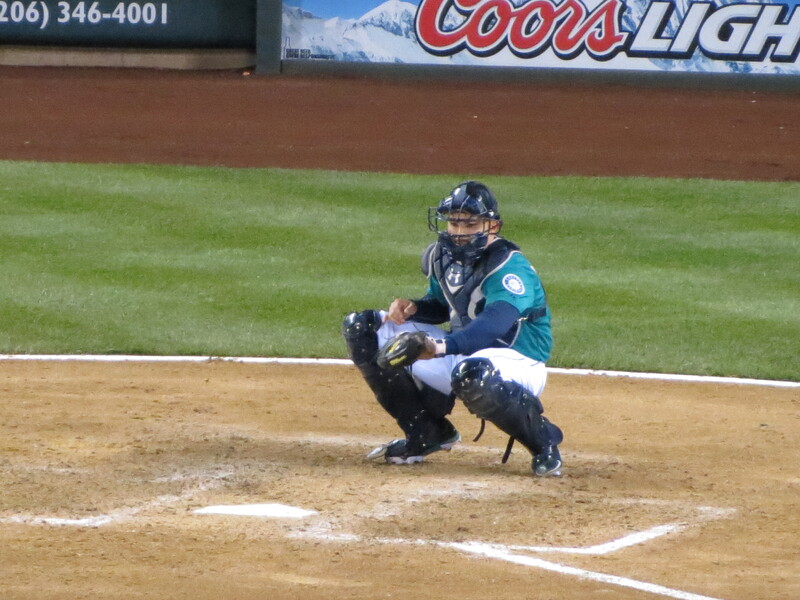 I haven’t seen Mariners fans truly embrace the save since JJ Putz, and frankly that’s just sad. Enough for now, I have to go mow the lawn. I have pictures from Saturday which I may post later today, but if I don’t cut that grass, I may get a visit from some neighborhood association I am unaware of. So until I have the chance to sit down and post again, enjoy your day.